Ronald Fraser! veteran of World War II movies who had won an award for playing Basil Allenby-Johnson in The Misfits had arrived on the shore of Coniston Water. Curiously so had two Stand-ins. A short lady for me, with dark hair, and a lady with blonde hair for Suzanna. I have blonde hair and Suzanna is dark, but that is how it was. The other four actors didn’t have stand-ins, which seemed odd. Simon West and Stephen Grendon, the two boys were younger than us, so that seemed odder. And we were some way into the filming. However the ladies were very excited about coming over to Peel Island. They sat in our positions and read our lines back to Ronald Fraser whilst the scene at the camp site was lit, and returned to stand-in for us later when his close-ups were shot. Somehow they managed to do this in scanty summer clothing dispite the brewing storm. My stand-in. 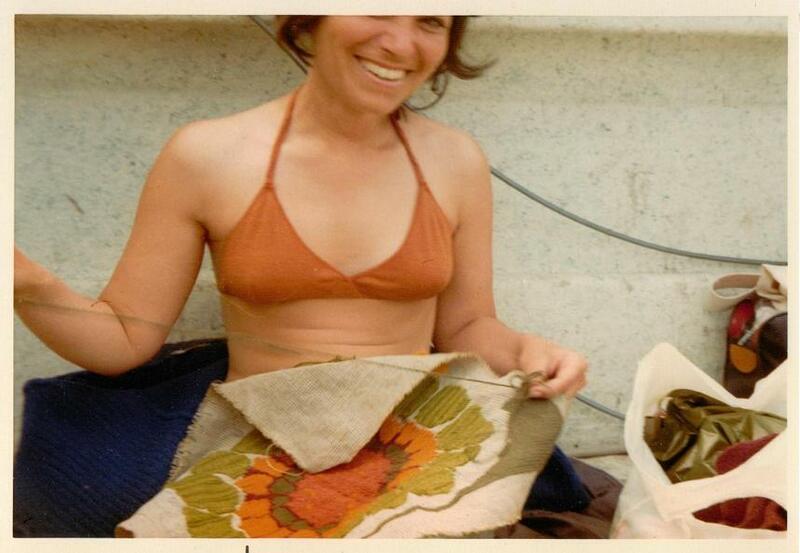 I liked her very much and was most interested in her tapestry, since I was doing one myself. Lots of the men in the crew were interested in her tapestry too. They hadn’t noticed mine. Our stand-ins got a lot of help from the crew as they went from boat to shore. We didn’t really, but then we were used to it and had to wear life-jackets. Mummy didn’t wear a life jacket, but she has always been surprising good at getting in and out of boats too. Enthused by our Stand-in, Lesely Bennett and I went into Ambleside that evening to buy more wool for our own tapestries. The poor production team. I think the recording of our scene with Captain Flint on Peel Island went well, and that Claude Whatham the Director was happy with the result, but my diary reports how a Force 8 gale came in. The Call Sheet for 20th June documents how truly unpredictable the weather was. We had a ‘Fine Weather Call’, an ‘Alternative Dull Weather Call’, ‘Rain Cover’ in the Houseboat cabin and a pencilled-in end-plan entitled ‘Peel Island’. Richard Pilbrow, the Producer, had a 1970s embroidered patch sewn to his jeans which read: THE DECISION IS MAYBE AND THAT’S FINAL. 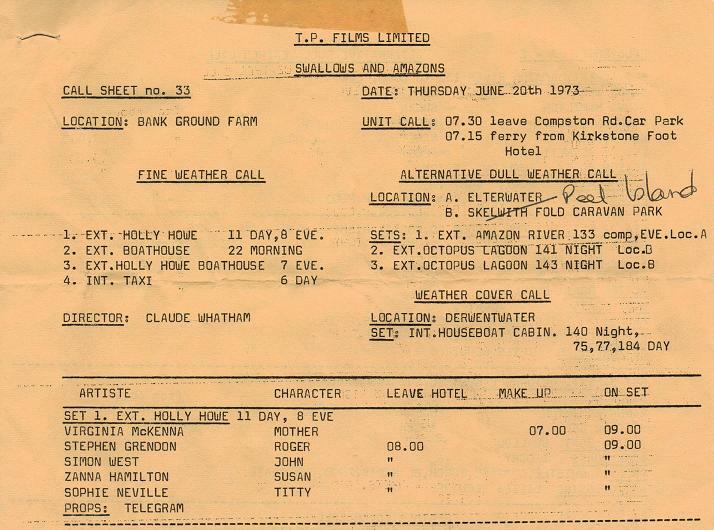 The Call Sheet that never-was for 20th June 1973. We ended up on Peel Island. The day that ended up on the cover of a puzzel promoting the movie. What had been good about the 20th June was that we, the Swallows and the Amazons, were all together, not sailing but on Peel Island, with the novelty of working with Ronald Fraser for the first time. Kit Seymour, who played Nancy Blacket and Lesley Bennett in the role of her sister Peggy, had been so patient, waiting day after day for their scenes with their Uncle Jim to come up. They were stuck having endless lessons with Mrs Causey in the red double-decker bus most of the time. But the fact that they were on Stand-by was hugely helpful to the Production Manager who had to wrestle with the film schedule and Call Sheets. Like a number of people, I suspect, I watch each ‘episode’ after you write about it. I noticed Kit Seymour blinking pretty much incessantly in every shot in the Flint on WCI scene. Was she having contact lens reaction or a form of nerves or . . .? I don’t know why Kit was blinking. She didn’t wear contact lenses and would not have been nervous. We may have had more lights out on Peel Island than earlier in the season. As you know, it is quite dark under the trees where our tents were pitched. Lee Electric somehow managed to bring over and power enough lights to bring in the sunshine. These can not be seen on most photographs but you can get an idea from the shots my mother took when Virginia McKenna was being Man Friday. I had grown used to them by this time and enjoyed the warmth they produced.